NIAGARA-ON-THE-LAKE, ONT.—It was a Saturday of wine and peaches and cream for Prime Minister Justin Trudeau. 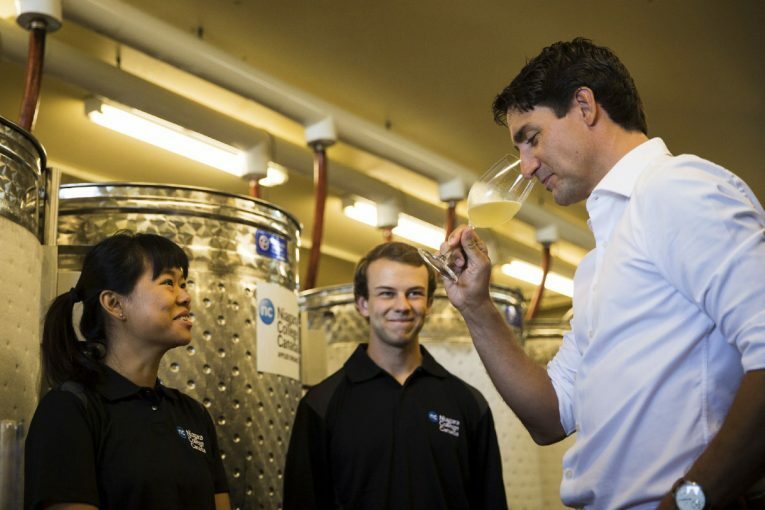 The prime minister’s first stop of the day was Niagara-on-the-Lake for a visit to Niagara College’s teaching winery, where he tried a glass of white wine made by students. He highlighted the winery program saying it helps develop necessary expertise in Canada’s wine industry. In Hamilton, Trudeau stopped at McMaster University where he helped two students move into their student residence and met with families and students at the campus. Trudeau also dropped by the annual Winona Peach Festival in Stoney Creek, Ont., where he posed for selfies and served up cups of peaches and cream. Trudeau also took in a festival of Toronto’s Tamil community later Saturday. He shook hands and mingled before praising Tamils for their contributions to Canadian society, saying that cultural differences are among Canada’s greatest strengths. The prime minister also noted continued instability in Sri Lanka and said Canada is committed to helping find a solution. Local politicians were also on hand, as was Toronto’s police chief. Organizers of Tamil Fest say the festival is the largest Tamil cultural event outside the Indian subcontinent. About 200,000 people were expected to go this year.